As the Red Sox and Orioles continue to trudge their way through trade attempts the obsession is winding down. There is barely a month and a half remaining in the cold winter and the two teams remain in discussion to swap sluggers. But just as you thought Manny couldn't complicate things more for the Sox there is now an apparent demand for any team who gets him to pick up one or possibly both of his club options valued at $20 million each. Ramirez is owed $57 million over the remaining three years of his contract. Part of that contract is a pair of club options which would trigger an additional year each at $20 million per. This most recent hurdle is denied by a source with information regarding the process, but at $97 million Manny would clearly out-price himself out of Baltimore. With recent trade rumors abundant things are certainly moving slowly. Reports last week had the Sox and Orioles involved in a four team swap which would have also included the Devil Rays and the Mets. In the deal the Sox would loose LF Manny Ramirez to the Mets, SP Matt Clement to the Orioles, and newly acquired prospect 3B Andy Marte to Tampa. But they would be filling two holes with CF Joey Gathright from Tampa and SS Miguel Tejada from Baltimore. The Orioles would be Sending off Tejada but would gain Clement along with SP Kris Benson from the Mets and SS Julio Lugo from Tampa. The deal seems to work for each team involved. The Red Sox have huge holes in their lineup from the departures of Johnny Damon to the Yankees and Edgar Renteria to the Braves. 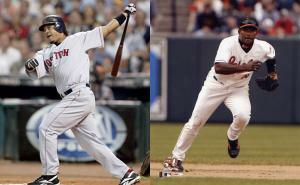 This four team mega-deal would fill both holes for the Sox. The Orioles wouldn't be able to replace the bat Tejada would be taking with him, but they would be able to fulfill their desperate need for pitching with Benson and Clement. Neither is a number 1 starter, but both would add depth and a decent 2-3 punch. Julio Lugo would also add speed and defense which is always useful. Although neither team seems to be willing to deal their superstars to teams from the same division these block buster discussions could spark smaller less involved trades between the teams. The Sox offered the Orioles Matt Clement and Ramirez for Tejada, the Orioles apparently rejected the deal. The Red Sox would likely want another outfielder thrown into the deal and the Orioles would likely want more money thrown in. The Red Sox have held discussions with the Tampa Devil Rays for Lugo as insurance should they not be able to pry Tejada from Baltimore. Lugo would provide a leadoff hitter the Sox lost with Damon as well as filling the shortstop hole brought by the departure of Renteria. Such talks could be facilitated by the Mets. The Mets and Rays are mulling over a deal which would send Tampa closer Danny Baez to the Mets for P Jae Sao and 2B Kaz Matsui. Although this could fall through on the insistence that the Mets also pay $6 million of the $8 mil that Matsui is owed. New York insists on including just $4 million. However if the deal goes through Lugo wouldn't be needed as Matsui could provide insurance until prospect B.J. Upton is ready for the big leagues.